Deck Problems to AVOID when building! Wood Rot: Because a deck will be exposed to the elements, wood rot can be an issue. Nail Pops: As wood naturally expands and contracts, nails will over time rise from the deck board. Mushrooming: A common composite decking problem that is unsightly and preventable. Board Cracks & Splits: A very dangerous side effect of face screwing and nailing deck boards. 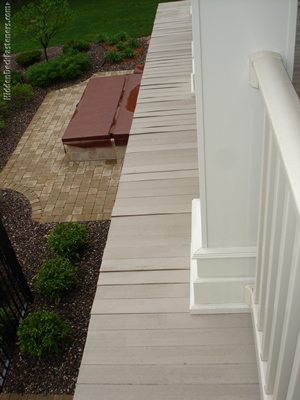 Each of the above decking problems is completely preventable if you use the right deck fastener system along with the right method of deck installation. Water has made the wood around this screw rot. 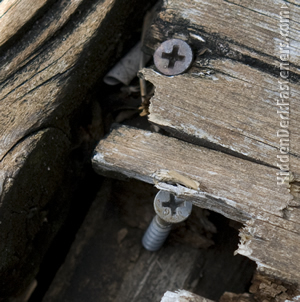 Wood rot occurs on a deck when face screwing or nails are used instead of deck fasteners. 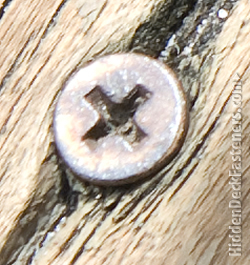 As you can see from the close up picture above, water and moisture have penetrated the wood surrounding the screw. 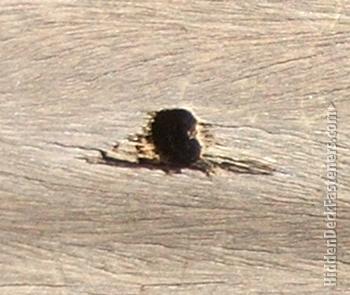 The result is the area around the deck screw gets stained and there is a steady decay of the wood around the screw. Once you have wood rot, the cost to repair a deck is immense and expensive. Many people completely scrap their deck and begin anew. Thankfully there is a way to ensure that wood rot does NOT become a problem for you. How can you prevent wood rot on a deck? Installing deck boards using hidden deck fasteners is the best way to ensure that your deck does not end up looking like the one here. Remember, the screw your looking at is one of many. Imagine what your deck would look like if it had wood rot. Since there is a definitive way to avoid this unsightly and unattractive decking problem, doesn’t it make sense to make sure that your deck remains as strong and as healthy as possible? After all, if you’re going to spend your hard earned money on decking using the right deck tools and hardware just makes perfect sense. There’s a good chance this deck will have many nails popping up. When you’re putting together your must-have deck tools and deck hardware list, if you settle on nails, cheap deck screws, and no deck fasteners, you are setting yourself up for multiple issues. When a deck has nail pops, it’s a very serious deal. If you look at the picture above, you can see that, while this nail hasn’t popped up yet, over time, the conditions are right for it to do just that. Why? Deck nails pop up over time as the wood expands and contracts naturally. You can’t avoid this from happening since wood will “breathe” as it absorbs and releases moisture. When a deck has been constructed in a shoddy fashion, what will happen is that the wood will eventually push up the nail, forcing it to literally pop up out of the decking. Nail pops are dangerous and can cause injuries due to falls, broken toes, or punctured skin. You can use your imagination as to what stepping on, or tripping over, a nail pop up would feel like. If you’re a soon-to-be-deck-owner, you also don’t want to have a neighbor or one of their kids trip on your deck since your insurance premiums would surely skyrocket thanks to the lawsuit that would be filed against you. If you want to save money and keep yourself, your family, and your guests safe, then there’s no reason to not use hidden deck fasteners. The use of a deck fastening system will allow for the natural expansion and contraction of your deck boards without nail pops. Because you use insert the deck screw at a 45° angle into the joist, you will have a smooth deck surface without having to worry about nails popping up on the deck surface. One of the drawbacks of building a deck with composite decking and using the face screwing method is mushrooming. Composite decking can “mushroom” when face screwing methods are utilized and the deck builder uses cheap composite decking screws. Basically, since composite decking is made of both plastic, wood, and glue, when a cheap deck screw is drilled into a composite deck board, some of the hard material often will rise above the deck surface and around the screw hole. It looks like the compote materials mushroomed over the screw hole. This can happen even days or weeks after the deck is installed! While I don’t have a picture to show, you (instead the one here is of some composite deck boards that are out of place because the deck builder didn’t use deck fasteners), I can tell you that a deck with a bunch of mushroom holes is gross and disgusting to look at. Getting rid of them can also be a tedious task. You can end up scratching your deck surface if you try to remove them carelessly, or with the wrong deck tools. Building a composite deck with deck fasteners is not only a practical idea, but it can make your new deck have less problems in the long run. If you value the money you’re about to spend on a new deck, then there’s no good reason to not use hidden deck fasteners to prevent composite decking problems. The last think you can afford is to have an unsightly deck that will make you lose time and money in the future. Nail cracks and splits are a common result of face screwing methods. Why? Because deck boards naturally expand and contract, the area around a deck nail or screw naturally starts to separate and, over time, the result is both ugly and, as you can see above, very dangerous for both pets and people. Cracks and splits that are left unattended often lead to the complete breakdown of the deck board. There’s no good reason to use face screwing methods when you see the above picture. Yes, using only deck screws to build a deck can be cheaper, but you’ll end up with a cheap looking deck that has the potential to be a dangerous one as well. Building a deck with deck fasteners is going to save you money in the long run. You will save money in less maintenance costs and ensure that your deck lasts for decades instead of years. If you want to own a deck that doesn’t look like the one above, then installing a deck fastening system is the only way to go.